The third use case tackles low-voltage grid management (i.e. 230/400v) and specifically targets DSOs. 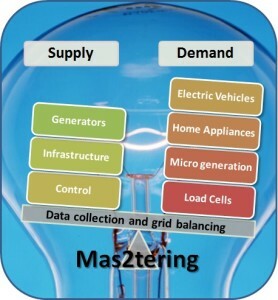 The use-case is an extension of use case 2, with the aim to demonstrate that local or district-level energy management, combined with effective grid monitoring and enhanced DSO / ESCO connections can significantly improve the flexibility and global balancing of the grid. the wider economic benefits to be gained through deferral of investment by utilising the existing infrastructure to greater advantage. This is becoming more achievable due to investment and development of enablers such as Smart Meters, making detailed consumption profiles and data available to consumers (and suppliers), improvements in communications and connectivity technology, and improved network monitoring, control and automation systems. All of this contributes to allowing the overall energy delivery system to be more flexible and cost-effective than has previously been possible. Various forecasts indicate a predicted 50% penetration of electric vehicles and domestic heat pumps by 2030, contributing to a potential 40-60% increase in overall demand/load by 2050. This would require a long term and costly investment in reinforcing and replacing the existing distribution infrastructure using traditional design and construction techniques. However, some parties estimate that utilising ‘smart’ techniques and designing more flexible, interconnected, and demand responsive networks could reduce that investment significantly, even in the order of 50%. This use case will be led by UPL, with the simulation and experimental deployment being implemented at the GDF Suez Laborelec facility situated at Linkebeek, near Brussels. The simulation will be undertaken on several layers, including Physical (e.g. generation, consumption and power distribution connectivity), Communications (e.g. traffic, system failures, cyber attacks) and Social (e.g. economical interactions between actors, usages, generation of consumption patterns based on socio-economical models of consumers’ homes, electric vehicles, etc.). The experimental facility includes a micro-windturbine, photovoltaic technologies, fuel cell, grid islanding system with batteries, additional loads and generating units, all of which will assist in emulating the behaviour of a ‘real’ district as described above. The detailed use case scenarios are planned to be delivered by May 2016, with assessment, validation and final report being delivered by May 2017.